Organic food recipes from a farmer? Hey, I don't just grow the stuff, I am the chief cook at New Terra Farm as well. And if you have met me you probably realize I LOVE food (perhaps 20 or 30 lbs too much in fact - but see more about that below). New: Here's my new free e-book, with some of my favorite farm recipes. I've been cooking for nearly 40 years; I was a 'latchkey kid', and was expected to get supper started before my parents came home from work. My dad was an excellent cook, and I have an uncle that is a professional chef and has worked all around the world. All of which to say, I understand and like food! So these are recipes I have gathered over the years - I don't have quite as many cookbooks as farming books (about 40 cookbooks vs 100+ farming books), but that is still a lot of information to draw on to create some wonderful recipes that anyone can use. Recently I managed to begin the process of getting back to my 'fighting weight' (or 'farming weight'). I'll write more about that but in the meantime check out the last page of Farm-Approved Recipes' to find a resource you can use too. This page is quite new, so check back; I'll be adding resources as I go along (when I'm not busy growing stuff). 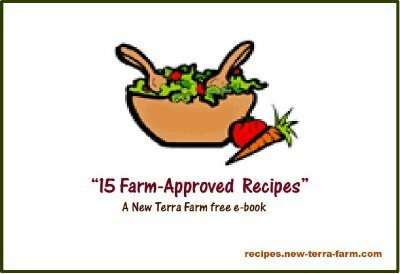 In the meantime Download 'Farm-Approved Recipes' for free and enjoy some tasty organic food recipes from New Terra Farm.